We recommend that towing be done only by an Authorized Mazda Dealer or a commercial tow-truck service. Proper lifting and towing are necessary to prevent damage to the vehicle. Particularly when towing a AWD vehicle, where all the wheels are connected to the drive train, proper transporting of the vehicle is absolutely essential to avoid damaging the drive system. Government and local laws must be followed. A towed 2WD vehicle should have its drive wheels (front wheels) off the ground. If excessive damage or other conditions prevent this, use wheel dollies. When towing a 2WD vehicle with the rear wheels on the ground, release the parking brake. A towed AWD vehicle must have all its wheels off the ground. Towing a AWD vehicle with either the front or rear wheels on the ground is dangerous as the drive train could be damaged, or the vehicle could trail away from the tow truck and cause an accident. 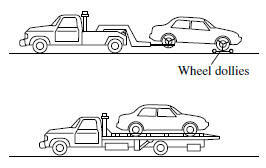 If the drive train has been damaged, transport the vehicle on a flat bed truck. ●Do not tow the vehicle pointed backward with driving wheels on the ground. This may cause internal damage to the transaxle. ● Do not tow with sling-type equipment. This could damage your vehicle. Use wheel-lift or flatbed equipment.